100 mm/65 Type985 х 2 pcs. 25 mm/60 Type96 mod. 116 х 1 pcs. Harugumo — Japanese Tier X destroyer. Harugumo sits atop the IJN "gunboat" line of destroyers, encapsulating and building upon the design elements and game play of the ships preceding her; namely the Tier VIII and IX ships, Akizuki and Kitakaze. Armed with ten 100 mm rifles and a single sextuplet torpedo launcher, she is a ship of absolutes; she has the highest base hit points and DPM of all Tier X destroyers, while also possessing the worst maneuverability (turning radius) and base detection range (tied with Khabarovsk). The most notable differences when moving up to Harugumo are the addition of a fifth main battery turret and major performance losses in the areas of handling and concealment. She also gains a significant amount of health in comparison to that of her immediate predecessors: a whopping 25,600 base health. Captains will also notice the significant loss in mobility — especially in regards to turning radius — as well as the far-worse concealment. Despite the major drawbacks found when upgrading to Harugumo, most captains will find that play styles that worked well on the previous destroyers are still applicable, albeit with some modifications. First and foremost, Harugumo is not a capture-point contesting destroyer. Her poor concealment, awful turning radius, and huge size make her incredibly easy to hit with torpedoes, and enemy ships far behind a capture point will have no difficulty landing shots on her. Enemy destroyers will see her coming long before she spots them, and a competent enemy destroyer captain can easily avoid being spotted by Harugumo. Captains should play Harugumo in a similar fashion to that of a light cruiser; stay outside of capture points early on, but stay within effective gun range to support the destroyers on the team who can capture. Engagements of all enemies should be done from within the relative safety of smoke or from behind islands. Open water engagements should be planned and executed a manner that minimizes the number of enemy ships that can engage her in return. Do to the 1/4 HE penetration of the Japanese 100mm rifle, Harugumo does not require the Inertia Fuse for HE Shells skill to do damage to enemy destroyers. However, captains who do use it gain the ability to penetrate 32mm of armor, a thickness found on most high-tier battleships in many places. This allows Harugumo to engage all ship classes with great effectiveness. Fans of Akizuki and Kitakaze will have no issues adapting their play styles to Harugumo. In the right hands, Harugumo poses a massive threat to all enemy ship types and can have a significant impact on the outcome of a match. Highest damage output potential of all Tier X destroyers. Largest base health pool of all destroyers. 1/4 penetration for her main battery results in no need for Inertia Fuse for HE Shells skill. Using IFHE anyway results in the ability to penetrate 32mm of armor with her HE. Low-caliber Armor Piercing is effective at engaging enemy destroyers when given broadside. Torpedo Reload Booster consumable allows her to put 12 torpedoes in the water every few minutes. Second worst concealment among Tier X destroyers, only beaten by 'Khabarovsk. Worst turning radius among all destroyers; turning circle is larger than that of many cruisers, in fact. Huge size makes her an easy target; battleship AP has no issues getting full penetrations against her. Only one set of six torpedoes per salvo with a long reload. Lack of a Repair Party ( ) consumable results in her having less "effective" HP than the two Tier X Russian destroyers. Lack of Defensive AA Fire ( ) consumable and large turning radius makes her an easy target for enemy aircraft carriers. There is only one module to research to acquire Elite status; the 8 km, 76 knot Type F3 torpedo. This upgrade is unnecessary for most captains, as the short range of the torpedoes make them quite difficult to use properly. Captains are free to research it on their own time. In Slot 6, either option is good. For captains that decide to not use Advanced Firing Training, opting for the extended main battery range is a good choice. If both Gun Fire Control System Modification 2 and Advanced Firing Training are used in concert, Harugumo can reach a whopping 17.47 km of range. It should be noted that that is not recommended, as engaging all but a stationary battleship at that range is nearly impossible. Key skills for Harugumo commanders include the standard "gunboat" destroyer skills. Captains who want a pure gunboat build should pick up both Basic Firing Training and Advanced Firing Training. Despite now having 1/4 HE penetration, taking Inertia Fuse for HE Shells is still recommended, as it now allows the Japanese 100mm gun to penetrate 32mm plating. Premium variants of the consumables can be used to increase her performance in battle. 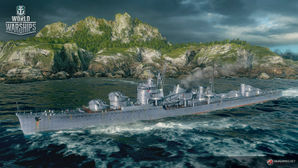 Players who wish to spend doubloons can equip Harugumo with Type 20 camouflage that lowers her detection radius, reduces the accuracy of incoming shells, reduces her repair costs, and increases the amount of experience she earns. Harugumo is an entirely fabricated ship design. In 2017, the developers consulted Sumeragi “Daigensui” Akeiko, WG Outside Research Advisor, on finishing the Akizuki line with a JMSDF destroyer, which she dismissed as impossible. She instead suggested that they simply use an enlarged "super-Akizuki" hull with an additonal turret. Harugumo was first announced at the Community Contributor Summit in St. Petersburg in April 2018. This page was last modified on 11 February 2019, at 15:47.